It's the perfect time to get cozy. This plush comforter set reverses to a sherpa texture to give you a softness so appealing you'll want it on your bed year-round. 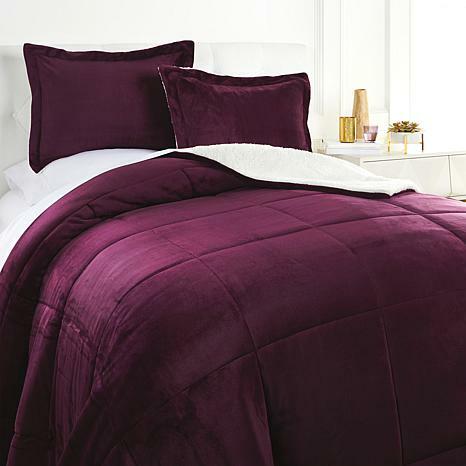 Use the oh-so-soft comforter and shams to get you through the coldest nights, and discover the most satisfying cuddles ever. I got the plum and its a beautiful vibrant deep purple, and, like some other people have said, although it looks heavy it isnt. It isnt cheap at all though. Its ridiculously plush and cozy. I love snuggling up in it, and my puppy can't get enough of it either. Love it. It looks great on my king size bed. Very soft and cozy.